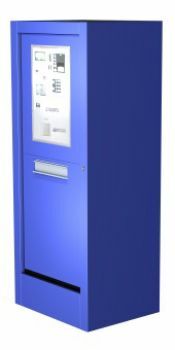 Constructed of 16 gauge vinyl-coated steel, these heavy duty units are designed to hold various types of Post Office stamp machines. This unit is handicap accessible. To operate, the postal carrier unlocks the USPS-supplied arrow "Y" Lock that activates two lock rods at the top & bottom of the cabinet. Private locks (Gem Locks) are available for non-USPS service. The inner cabinet rotates 180 degrees so that the rear faces the front. After distributing the mail, the inner cabinet is rotated back to the customer position. An optional rear cover is available if the unit is not positioned against a wall. Covered under US Patent # 4,509,676.